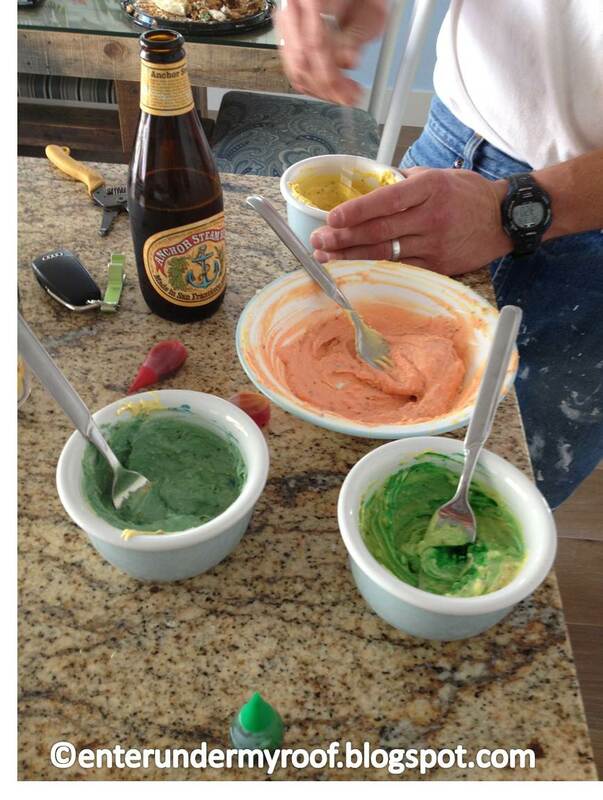 There’s no denying it…dying eggs is just a part of Easter. Knowing a bit about their history – and that they have long been a part of celebrations – makes it all the more fun. The inevitable side of dying eggs is you end up with lots of hard boiled eggs. Deviled eggs are a great way to use up some of your eggs (plus they make a great appetizer on Easter Sunday). Since it’s Easter and all, though, figured it’d be fun to “Easterize” the eggs! The eggs are colored with a few simple household ingredients, so you don’t even need to go to the grocery store. How perfect is that? Hard boil your eggs, and gently peel off the shell. Be sure you peel off that little layer of skin that sometimes sticks to the bottom of the egg, too. Cut the eggs in half lengthwise, and put the yolks in a bowl – you’ll use them later. Rinse off the eggs (gently!). You want to get any extra shell, yolk, skin, etc. off of them. Set them down and let them dry. 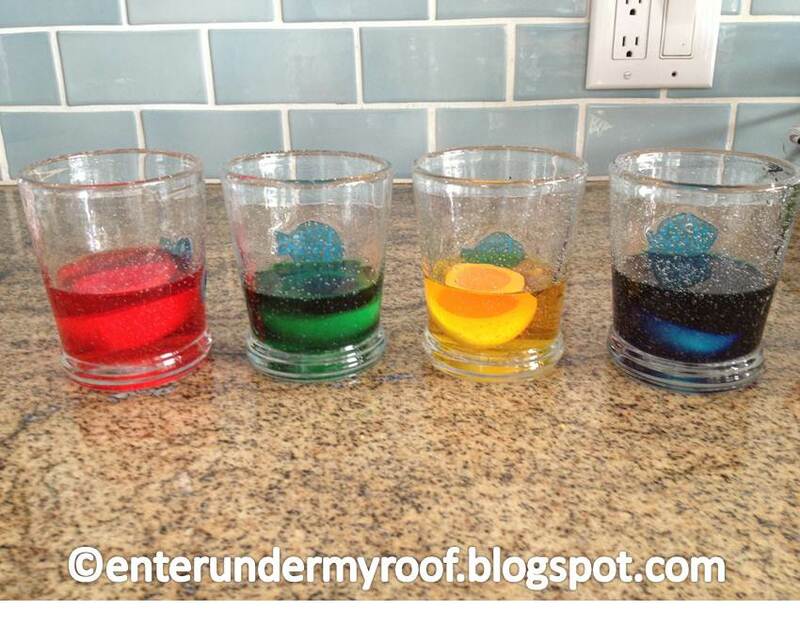 In four separate glasses, add two tbsp white vinegar, six drops of food coloring, and then fill about 1/3 the way with cold water. Place the eggs into the glasses, one at a time, and allow them to color. Coloring starts instantly, and then gets darker the longer they are in the mix. Check them frequently until they turn a color you like. Remove them from the mix, drain, and place onto a plate & allow them to dry. Crush the yolks with a fork…I like mine pretty smooth, so I mash them quite a bit. 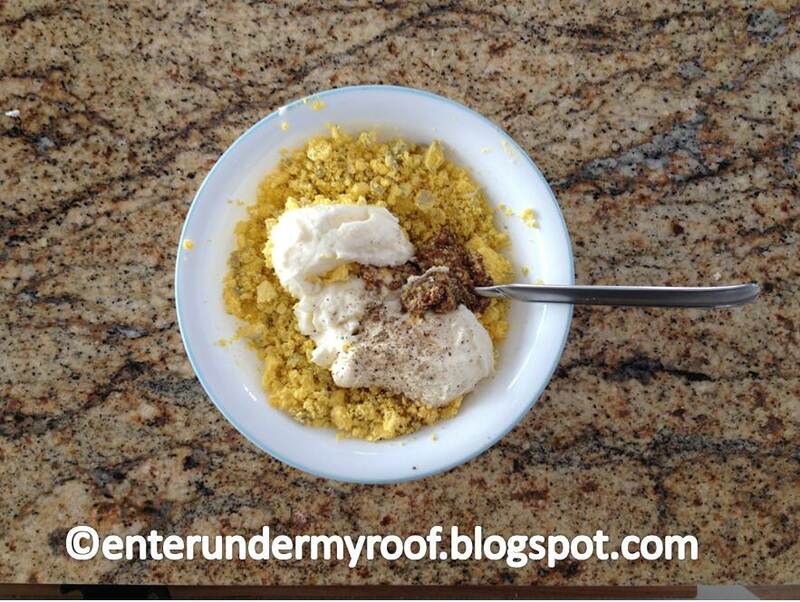 Add the vinegar, mustard, mayo, salt, and pepper and mix well to combine. Pipe (or spoon) the colored yolks into the eggs. I used a large cake decorating tip as I thought it was a bit more decorative. Just for fun…this post links up on Catholic Inspired and Catholic Carnival. « Easter Symbols – and where the egg came from! Thanks for joining us. Those eggs are pretty! RAnn, thanks for stopping by! 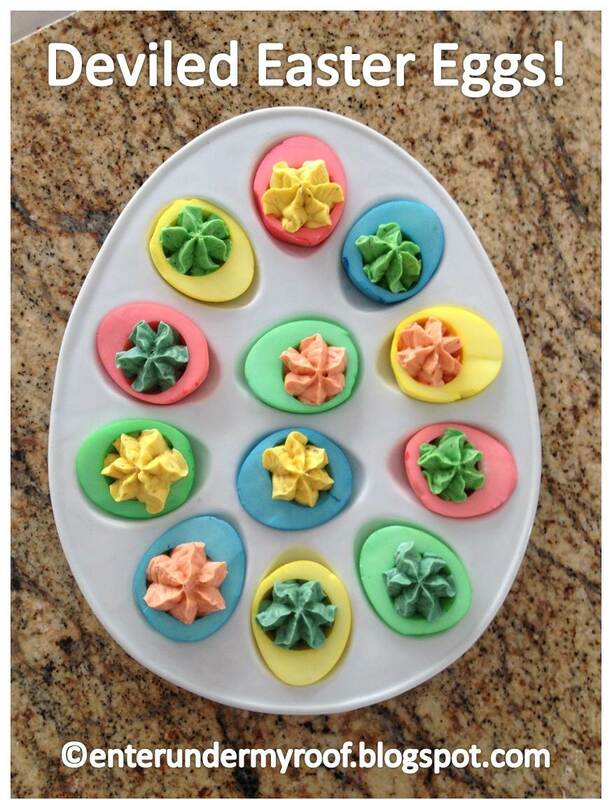 The eggs turned out quite yummy…once you got past the fact that they were blue with green filling. Ha! Keep up the book reviews – you're creating quite the "to do reading list" for me!